It’s hot out there Prague. Really hot. 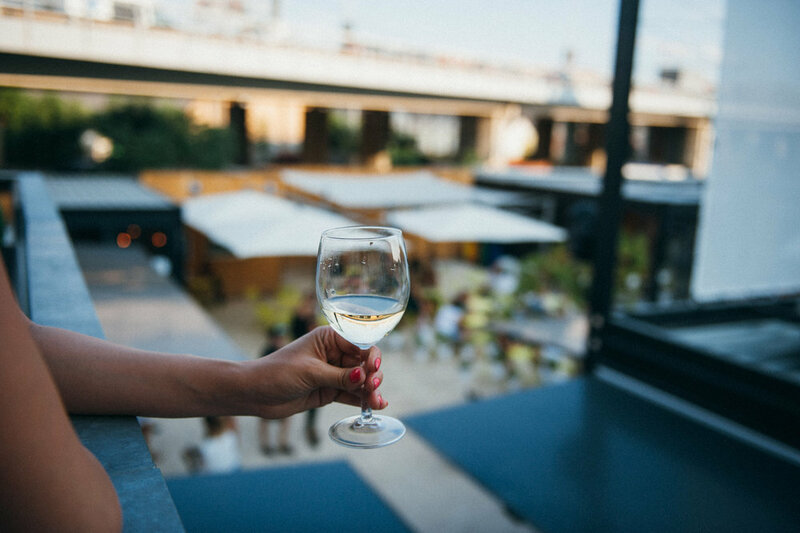 Stay cool with our carefully curated list of most refreshing beverages at Manifesto Market. From cocktails and beers to coffees and wines, all concocted with plenty of passion and personality from small, family producers from both the Czech Republic and abroad. These homemade lemonades made from Piu Piu syrups have turned lemonade alchemy into an art form. Perfectly simple and not too sweet. Made from local, seasonally-available fruits it will leave you feeling like you are drinking in summer. Deliciously sour-and-sweet sea buckthorn? Refreshing cucumber? Mouth watering raspberry + basil? Herbal-ly lavender? Sounds like summer in a [biodegradable] cup! We’ll take them all. Where can you find them? Manifesto Bar in containers 7 and 26! Manifesto’s drink designs don’t stop at lemonade. Their summer cocktail creations have something for everyone. Bourbon lovers? Pick-Me-Up is summery blend of sea buckthorn and melon. Always looking to explore something adventurous? Try the Gran Torino - Campari with raspberry and prosecco is a Czech spin on some Italian flavours. Maybe you are chasing that endless summer feeling? Savour a Vertigo with rum, lavender and ginger and pretend you are still on holiday! Where can you find them? Manifesto Bar in container 26! Brewmasters Únětice pivovar and local favorites Vinohradský pivovar can always be found on tap. These well-loved breweries take Czech craft beer to the next level, and if anyone knows their way around beer, it is the Czechs. These perfectly poured golden liquids are sure to refresh you on a hot summer day. In addition to the local kings of beer, a different microbrew will be featured, with something new to try every time the keg runs out. Stop by to see what the brew of the moment is! Beer not your fancy - try Johannes ciders. This family-owned cidery makes their beverages from Czech-grown apples hailing from southern Bohemian town, Tabor. Where can you find them? Manifesto Bar in containers 7 and 17! Your Czech microbrew exploration doesn’t have to stop there! Local brew-pub Bad Flash provides and assortment of bottled beers from both Czech and international brew bosses. Try Zichovec, found in the northern Bohemian countryside, this small brewery branches out from traditional Czech pilsners and has some adventurous things to sample. The sour passion fruit, or sour guava, for you sour-beer lovers or the Juicy Lucie New England IPA - perfect for summer. And what’s a drink list without some wine? You can taste Gran Fierro’s selection of Argentinian wines. While the region is famous for its Malbec, it may not be the most refreshing on a hot day. Try the incredibly vibrant Torrontés - a young wine grown at a high altitude in the Mendocino region. Full bodied and fruity, its elegant full flavour profile is everything you could want on a summer evening. Perhaps it’s most striking characteristic is its striking fruity aroma and crystal clear colour. Looking for something bubbly? Grab some friends and a bottle of Wine Food’s Franciacorta. It’s a brut-style bio-made wine from the Lombardy region in northern Italy. This refreshing treat goes hand in hand with a poké bowl from Poké Haus. Poké is a Hawaiian-Japanese fusion dish so it make sense that such a refreshing Japanese soda would suit it well. Sweet and citrusy with an almost-floral like taste will leave your tastebuds intrigued. Perhaps the most unique part of enjoying this beverage is the distinctive design of its bottle - made of glass and sealed with a marble. To open, take the device used to open and push it into the blue cap which forces the marble inward, releasing the bubbly goodness. Pour over ice and enjoy. Looking for something equally exotic? Try the sparkling sake! Similar to prosecco but made from rice instead of grapes, as sake is, but with enough bubbles to make you feel extra fancy. Zazracna Limonada is something truly special, and unlike anything you have likely tried. 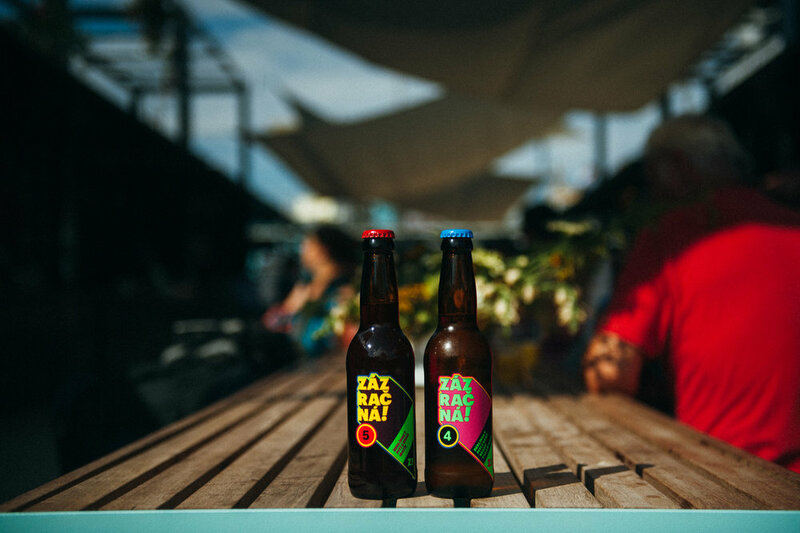 Playing on the Czech love for all things herbal (and they swear by their health benefits) you can satisfy your thirst with anything from maté to saffron and chocolate to cream sodas and are ensured to take your tastebuds on an adventure. Created by master bartenders from some Brno’s most thoughtful bar concepts and talented mixologists. They make flavors from non-raw materials - everything from extracts, reductions, and infusions with real fruits, herbs and spices - nothing chemical, ever! Where can you find them? They are hard to miss with their eye-catching, throwback labels (We <3 them!). Find them perfectly paired with a pulled pork sandwich or pastrami from Meat Vandals. Where can you find them? Meat Vandals in container 3. Those who know their flagship cafes, know their seasonal selections of lemonades is always exquisite - including rhubarb-vanilla, passion fruit with peach, and our personal favorite, blueberry + coffee. Yes, you read the correctly, blueberry and coffee! The perfect marriage between sour wild berries and the bitterness of freshly roasted coffee beans, make this a refreshing summer treat not to be missed. Specialty coffee roasting masters, Doubleshot, is always coming up with something to reinvent on how we enjoy coffee, and take your tastebuds on an adventure - this beverage is no exception. Don’t take our word for it though, try it yourself! Where can you find them? Doubleshot in container 9! Their tricks don’t end there. This favourite of coffee aficionados is one for the iced coffee crowd. Cold brewed coffee served like a Guinness from a tap and infused with nitrogen can satisfy even the milk-and-sugar crowd with its clean, smooth taste and velvety texture. Watching it swirl around and settle in the glass is almost as satisfying as drinking it. Doubleshot uses single-sourced beans from Kenya known for its deep, wine-like acidity and powerful character. To best enjoy its distinctly fruity taste, drink without milk or sugar! (More room for Angelato :D) Black coffee still not your thing? Don’t worry they still have sweet, espresso tonics or classic iced latte to satisfy that summery caffeine craving. Where can you find it? Doubleshot in container 9! The proverbial nightcap to our article, making this a hat trick for Manifesto Market’s cardinal caffeine creators at Doubleshot, proving that their expertise expands beyond the morning hours and into some serious aperitivo architecture. This smooth and complex take on the classic Italian Negroni is bitter as it is sweet comes straight from the tap with all that nitro silkiness, is the perfect afterwork drink. Looking for something with coffee? If we have not rambled about this one enough - take your coffee on nitro up a notch with their iced Irish coffee. It's exactly what it sounds like - the classic "adult" coffee beverage, summer-ized with a smooth, nitrogen-infused cold brew, Irish whisky, a hint of vanilla and cream.